How would I install a new toilet in my RV? I’d like to go to a bigger one. Is the RV toilet the same as a toilet in a home with the two bolts and the wax ring? Or is it an entirely different hook up? 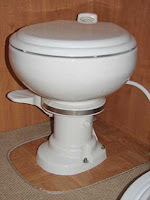 Armin, the RV toilet differs from a typical house toilet in that it does not have a back tank. As you know, coach owners must conserve all resources so RV toilets are designed without a back tank in order to conserve water. They flush using very little water comparably. The good news is that they all mount to the floor flange in the same manner with a couple of exceptions. Some RV toilets utilize four mounting bolts instead of the usually two. And some two-bolt installations have the bolts positioned at 11 and 5 o’clock instead of 9 and 3 o’clock. Adapter kits, however, are available that make RV toilet installations simple for most handymen. 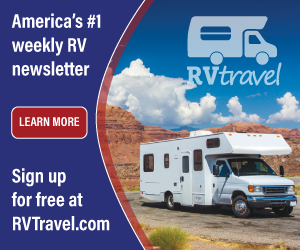 There are many RV toilets on the market; take a look at any accessory store for an assortment of sizes and styles. I personally favor those made from porcelain instead of the usual plastic. They have the look and feel of a standard house toilet, sans the back tank. As a suggestion, check out the Magnum Opus RV toilet, developed by Dometic. It is constructed of 100% vitreous china. RV floor flanges are identical to most modern homes but rather than a wax ring, I recommend a rubber seal to eliminate the possibility of heat softening and distorting the wax ring, thereby, loosening the toilet. This situation isn’t common with houses, but could be with motorhomes.